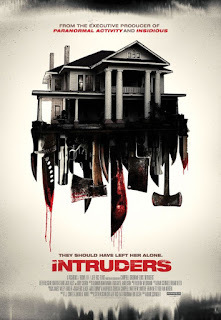 Tag line: "They should have left her alone"
For a while there, Intruders looked as if it was going to be your typical, run-of-the-mill home invasion movie. But as it turned out, this 2015 film by first-time director Adam Schindler had some surprises hidden up its sleeve, and even if the final reveal wasn’t much of a bombshell, the majority of the movie twisted and turned just enough to keep me guessing. As the story opens, Anna Rook (Beth Riesgraf) is caring for her brother Conrad (Timothy T. McKinney), who is dying of cancer. Living alone in the house they grew up in, the Rooks receive very few visitors; delivery boy Dan (Rory Culkin) shows up every day with a hot meal for Anna, and Charlotte (Leticia Jiminez), a lawyer, has been trying to get Anna to sign some papers dealing with her brother’s last will and testament, but aside from that the siblings are very much alone. In fact, Anna, who has a bad case of Agoraphobia, hasn’t set foot outside the house in 10 years. Conrad’s dying wish is that his sister live a little, become “part of the world” around her, but when he passes away, Anna can’t even bring herself to attend his funeral. As a result, she’s home when three would-be crooks; J.P. (Jack Kesy), Perry (Martin Starr) and Vance (Joshua Mikel) come looking for the money she has stashed away (we discover in an earlier scene that Anna has a bagful of cash, which she keeps somewhere in the house). Assuming she’d be at the funeral, the thieves are surprised to find her at home, and, taking advantage of the situation, try to get Anna to tell them where she’s hidden the loot. It isn’t long, though, before the trio realizes their “hostage” is not the shy, introverted victim she appears to be. At the heart of Intruders is a fine performance by Beth Riesgraf, aptly portraying a woman whose past has left her severely traumatized, yet not without the will to defend herself when the situation calls for it. We sympathize with her early on as she’s caring for her dying brother, so much so that, when she eventually turns the tables on J.P. and the others, we’re still squarely on her side, and it’s to Riesgraf’s credit that we never lose this connection to the character. As for the movie’s major twist, which occurs at about the halfway point, I was on-board with it, and liked how the film toyed with the audience in much the same way Anna did with J.P. and his gang. Where it fell apart (for me, anyway) was in the big reveal at the end, when we learn the source of Anna’s troubles (and why the house has so many interesting “features”). Thanks to a brief conversation between her and Conrad at the start of the film, I had no trouble figuring out early on what caused Anna’s deep psychological scars, and for a movie that spent a fair portion of its run time trying to surprise us, this finale was a letdown. 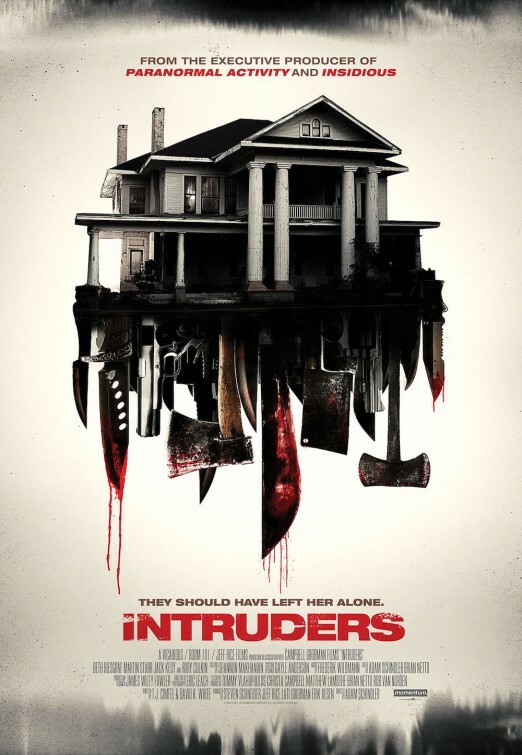 That aside, Intruders works well enough most of the time, and while it isn’t an overly violent home invasion film (though it does have its share of bloodshed), it’s tense in all the right places.